Home » Interests » Adventure » Conquering fears: Take two! A couple months ago, we went to a high ropes course close to home. Rob and Ellie attacked it with gusto. I looked at the first obstacle and froze. Totally. Chickened. Out! That kind of thing used to stop me in my tracks. Fear would keep me from trying new things. 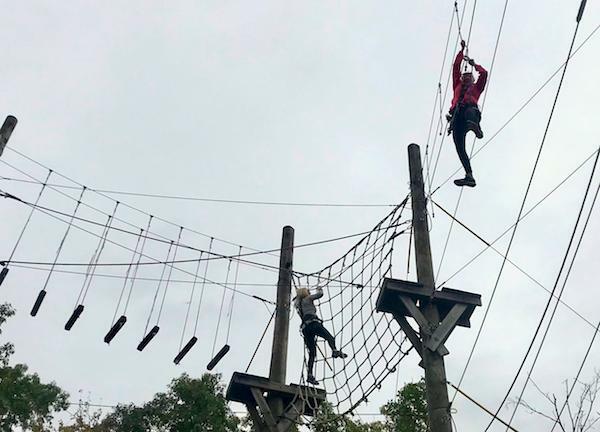 When I got the chance to do the high ropes course at Nemacolin Woodlands Resort in Pennsylvania, I said yes. Now, don’t get me wrong. It wasn’t a YES!!! Let’s do this. It was more of a heart pounding, shaking like a leaf, yes-because-I-can’t-let-the-fear-win kind of yes. And I geared up. Completed the safety training. Lined up between two braver women than I. And waited my turn. 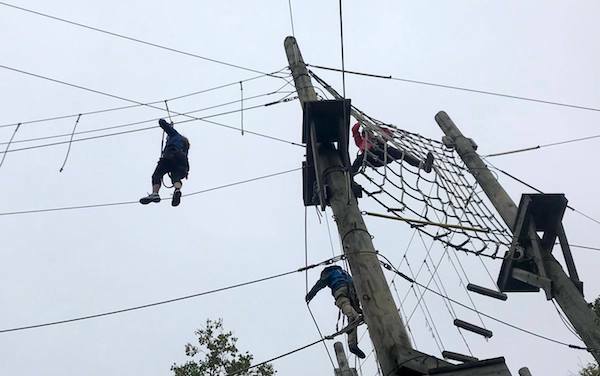 The high ropes course at Nemacolin takes “high” seriously! Before I even got to the first ropes challenge, I had to climb a telephone pole. Seriously! Then, reaching the three foot wide platform, I had to stand up to hook into the safety rope. Standing up. Way up there in the sky. There’s a staffer to assist, so I wasn’t alone. But, my wobbly knees weren’t convinced. Upright and hooked in, I inched my way to the first obstacle and froze. Just for a moment, though. My friend, Nicole, stood at the far end of the platform and coached me through it. She didn’t let me dwell on the fear, just the course. And, miraculously, my feet moved. And my hands. Then my feet. Then my hands. And I made it to the far platform. What a thrill. Nicole moved through the next obstacle, and I talked Amy, the brave friend behind me, through the first obstacle. It was like a game of telephone only way more fun! I’m in the pink, finishing the second obstacle while Nicole walks the tight rope ahead of me. For safety, the staffer is there to assist should we need it. Amy followed me through the rope net as I fought my nerves on the tight rope. We went through the course, challenge by challenge. Nicole. Me. Amy. Before I knew it, I was at the last obstacle, a fun zip line ride back to terra firma! My victory lap. After the course, we also rode the super-zip, two zip lines down the ski slope. The first was 1,700 feet long and the second just a bit shorter. Speeds here get up to 60 mph — woo hoo! And there you have it. Conquering fears — take two! It went much better than the first time. 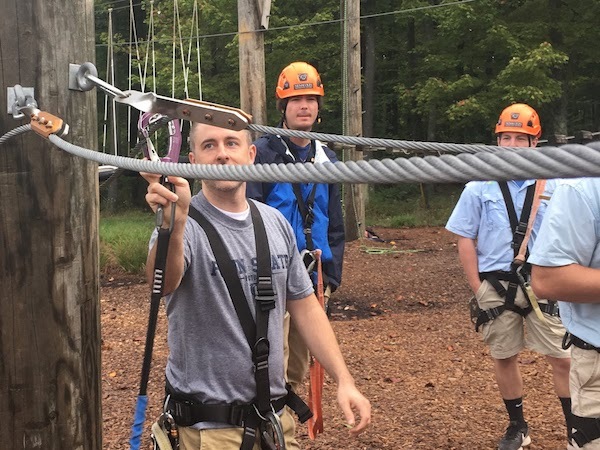 Ropes courses ARE challenging, but they are doable. 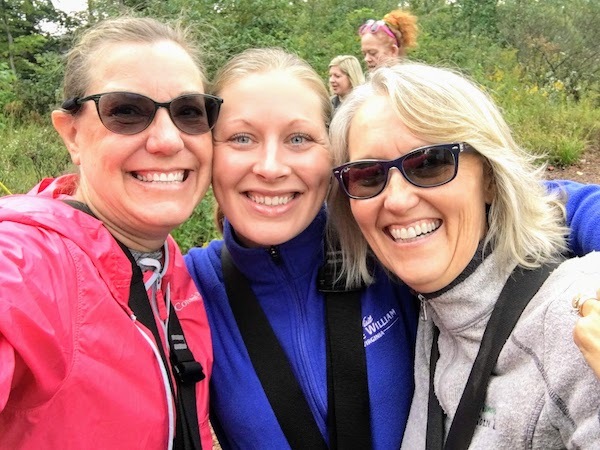 With Nicole’s help, I learned how to use my strength and balance to get through the course. It’s okay to chicken out, but not to quit forever. 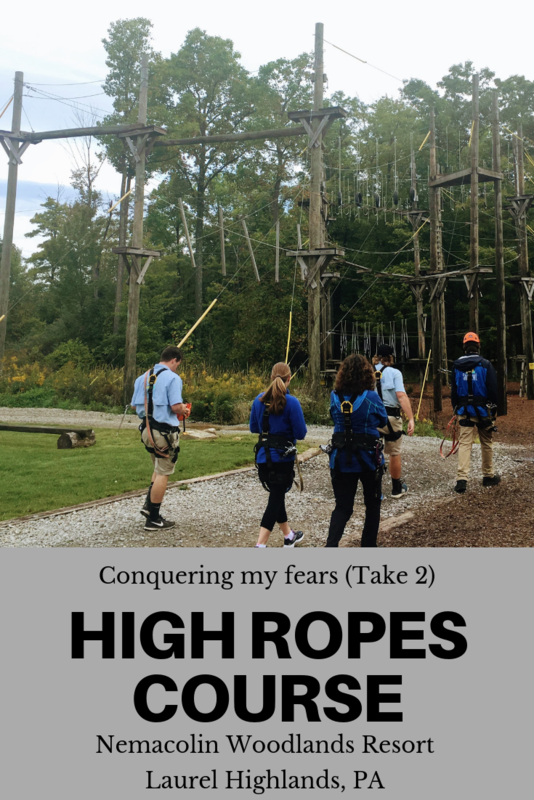 I really wanted to conquer a high ropes course to prove to myself that I’m able. It didn’t work the last time, but I tried again. Teamwork really does help. Nicole talked me through the obstacles. I talked Amy through them. We got through the course together. It’s only been two weeks since that adventure, and I’ve already been to another ropes course closer to home. And I conquered that course, too! Victory. 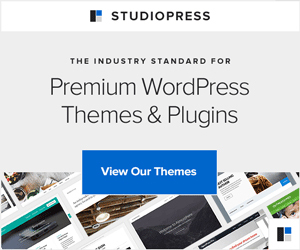 Have you faced a challenge to overcome it? Share your story in the comments! Let’s celebrate success together. 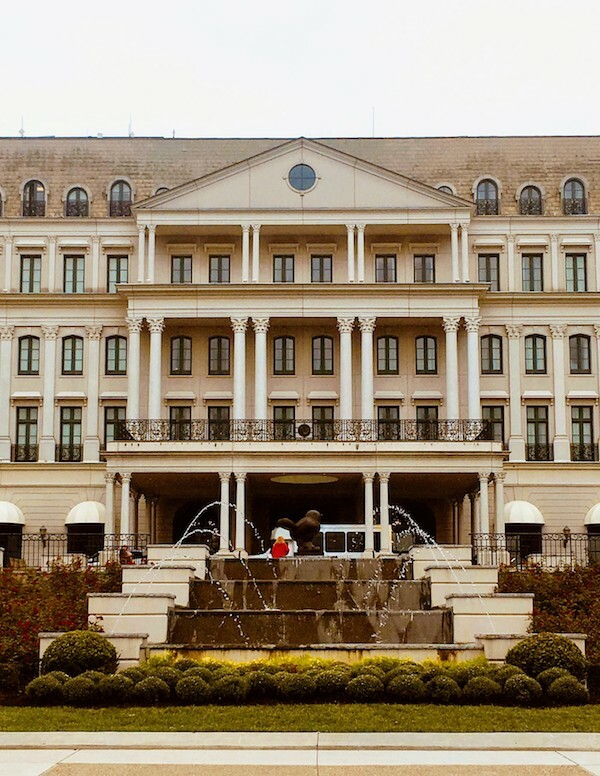 Nemacolin is located on 2,000 acres in the Laurel Highlands of Southwestern Pennsylvania. The resort has a variety of accommodations, from luxurious guest rooms in the Chateau Lafayette to vacation homes and the spectacular Falling Rock, inspired by the architecture of Frank Lloyd Wright. They even have pet friendly accommodations so that your furry family members can go, too. Of course, Nemacolin includes all the essentials of a luxury resort: a five star spa, championship golf, pools, children’s programs and restaurants. But, it’s got a lot more, making it a vacation destination of its own. 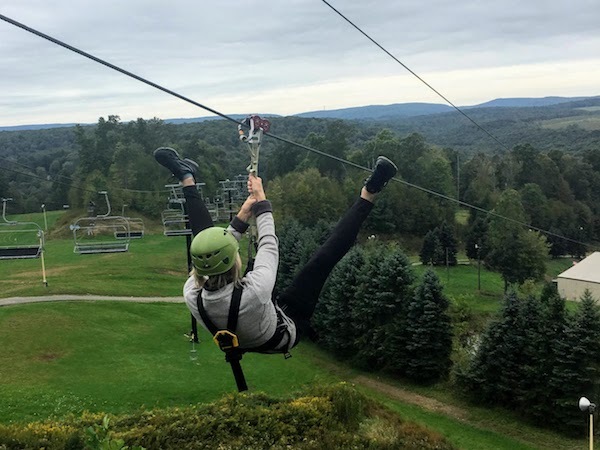 But what I love most about Nemacolin is the number of unusual activities to try. It’s a great vacation destination for adventurers who want to try it all! Of course, I recommend the high ropes course and zip line! But, if you want to keep your feet firmly on the ground, try sporting clay at the shooting academy, archery or horseback riding. Take an art class, shop at boutiques or warm your feet at the camp fire outside the lodge. 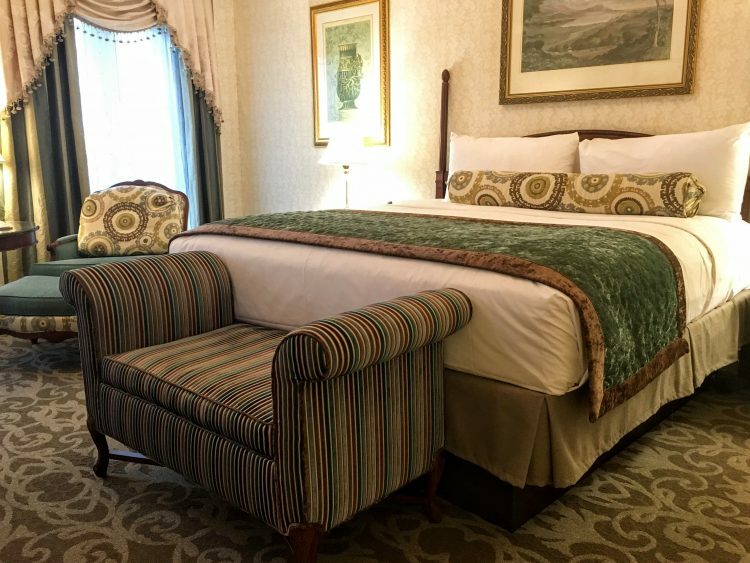 My stay at Nemacolin was hosted for a travel conference, and I genuinely enjoyed every minute! I hope to return sometime soon with my family to explore even more of this great resort. Way to go Karen! As one who remained on the ground, I was really impressed with how you all and helped each other through the course.Maybe next time I’ll join you on the ropes. Thanks, Julie! I hope you will join us next time. It’s amazing how knowing what to do makes the obstacles much “easier.” Okay — not easier, but manageable. Thanks for the pics!